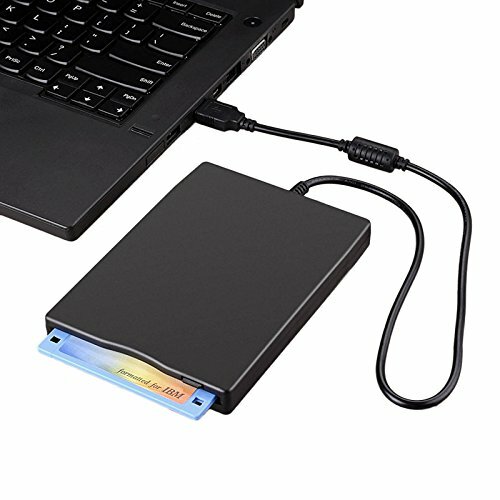 Now many computers/laptops do not come with floppy disk drives, this super slim and lightweight external USB Floppy Disk Drive which reads and writes standard 1.44 MB floppy disk and has a fast data transfer rate of up to 500kb/s is the best device for accessing floppy discs on your desktop or laptop. This is a USB 3.5" FLOPPY drive, NOT a USB CD-ROM or USB DVD-ROM. Simply connect it to USB port on PC/laptop to use 3.5" high density diskettes on your machine. Get power directly from USB port, no more external power needed. External Floppy Disk Drive with USB interface. Read/Write 1.44 MB floppy disk. USB 1.1/2.0 compatible. High quality hard plastic enclosure, durable, high class external design. Super slim and lightweight, easy to carry, ideal for Desktops and Laptops. No external power required, Powered directly from the USB port. Powered directly from the USB port, no external power required. Give new life to your old floppies, also can be used for Windows installation. Compatible with Windows ME/2000/XP/Vista/Win 7/win 10. If you have any questions about this product by Sunjoyco, contact us by completing and submitting the form below. If you are looking for a specif part number, please include it with your message.